For a moment, I would like to write about what I’m currently doing, as opposed to things I’ve done some time ago. 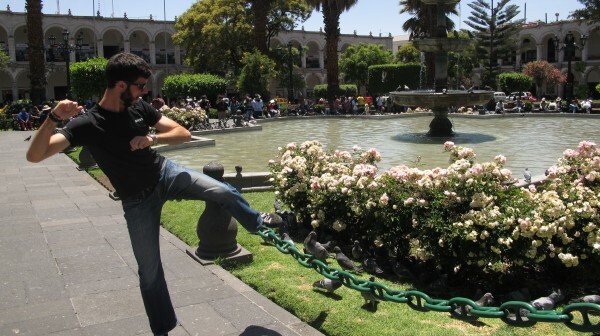 Don’t worry, dear readers, there will be posts upon posts about couchsurfing in Santiago and Mendoza, about our endless, nauseating bus rides in Bolivia, bike riding the Death Road, and much more, but for now, I’d like to show appreciation for my current locale, Peru’s second largest city, Arequipa. Sometimes, whilst traveling, you arrive in a new city and immediately fall in love. 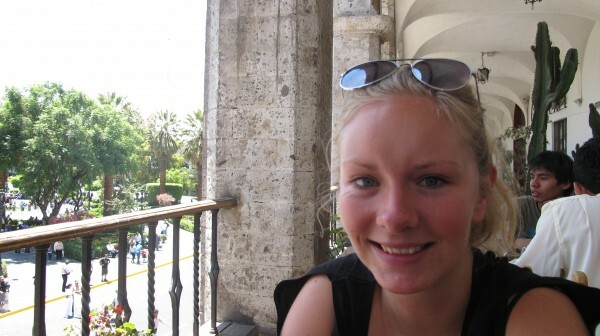 Such was the case for me in Edinburgh, and again, it is so with Arequipa. The city inspired from the first night, with accommodations better than we’ve seen (or even dreamed about) throughout the trip, and a top-class dinner (again, the best of the trip). Out of the hostel dorms, and into our own, wonderful, private domain, we slept well and awaited a new day of exploration. One of my favorite things to do in a new city is to aimlessly meander around. At 2300 meters above sea level, Arequipa would not, on its surface, appear to be an amble-worthy city, but after spending more than two weeks at or above 3000 meters (often a great deal over), the relatively low altitude is a–pun perfectly intended–breath of fresh air. Consider the following, La Paz, at 3700 meters, is the highest capital in the world, but it also represented one of the lowest points during our stay in Bolivia. The extra 1000 or so meters of air has been greatly appreciated. The feeling of joy that comes from being able to walk more than twenty paces without gasping for air cannot be overstated. 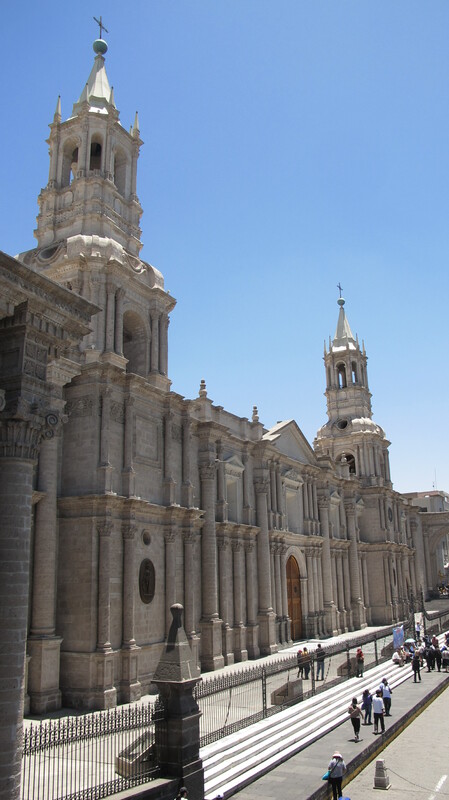 Arequipa, known for its beauty, is nicknamed the White City due to its abundance of white stone buildings. Despite its status as Peru’s second largest city, the population is still well under one million, and it still feels cozy and out-of-the-way. While the masonry for which the city is best known provides a great setting for pictures and my aforementioned wanderings, the background is equally impressive. Just beyond the city–precariously close, if you ask me–sits two imposing volcanoes, El Misti and Chachani. The cone-shaped and formally snow-capped El Misti tops out at an impressive 5800 meters, and is still active; its last eruption was in 1985. Chachani is slightly taller, topping 6000 meters and still maintaining its snow, and has a jagged, craggy look. The volcanoes, while occasionally destructive, also provided the white stones for which the city is known. The haze and dust from the surrounding desert give the mountains a surreal quality, almost as if they were a backdrop to be chosen for a series of cheesy family photos from Sears. So, with beautiful sights all around, and four lungs full of air, Christine and I set out on this small Southern Peruvian oasis of civilization. First, we had an excellent brunch in an outdoor café overlooking the main plaza. Below us tourists fed pigeons and a series of protests circled the square (as it were). The first protest was exceptionally organized, and had something to do with nurses, as best as I could tell. The women wore matching nurses uniforms, yelled slogans, blew whistles, and peacefully held up traffic just long enough to get their point across. The second protest, while larger, was far less organized. This consisted of a random group of older gentlemen, some drums, and a car with an attached P.A. system shouting out slogans that, were they in English, would have still been indecipherable. After brunch, we walked about the city with no real purpose. Now and again we stopped in shops to pick up a soda or a snack, but mostly, we just enjoyed the views. By the middle of the afternoon, we found a small park, complete with a statue and old cannons, and read for a bit on the well-manicured lawn. At some point, we got the notion in our heads to see the new James Bond movie, Skyfall. We had had this notion twice before, in two different countries, no less, and both times we had to return to our hostel crestfallen, having not seen the movie. In Chile, the proprietor of a small cinema told us he would be showing Skyfall the following night around 10 o’clock. Instead, he showed it as a matinée, and we missed it by several hours. Again, we tried in Bolivia. We had the idea to make a date night out if it, dinner and a movie. Instead, the restaurant, which had enthusiastically insisted that they take credit card, only took cash, thus eliminating the cash we were going to use for the movie. Peru, and more specifically Arequipa, would not be so cruel, and we finally saw James Bond doing his thing (namely women, explosions, and shooting bad guys). We even got popcorn. Tomorrow, we leave Arequipa to explore the Canon del Colca, the second deepest canyon in the world. As in life, so in travels, the journey must continue.